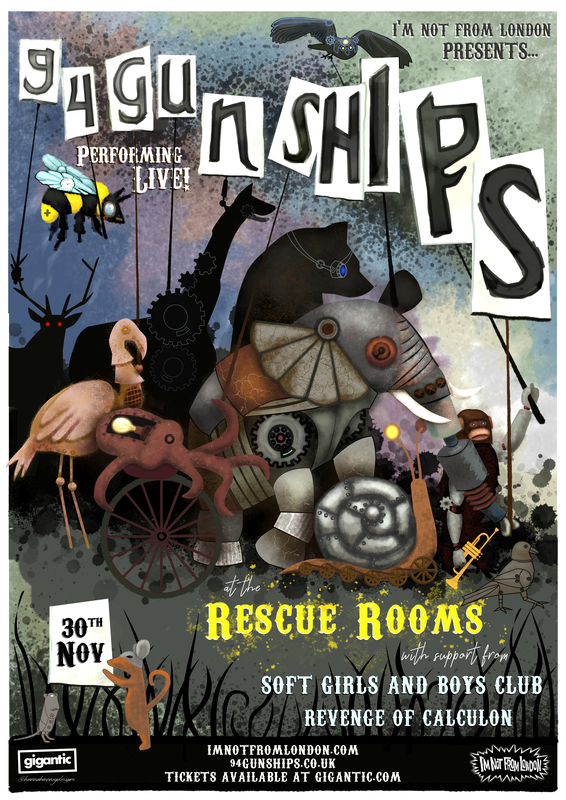 Lily talks to the Gunships ahead of their gig tonight! You guys looking forward to tonight? What can we expect? Russ: Of course we’re looking forward to it! Mark: We’ve not played in Nottingham this year. We’ve been playing all over the country at various places. That’s not because we didn’t want to play in Nottingham, but we just thought as a band who plays here, you can saturate that. We don’t want people to get sick of seeing us and we want to get a bigger outreach of our stuff. But, we’ve had this in minds for quite a while so we thought let’s do it. It’s a sort of homecoming gig sort of thing. We are all really looking forward to it. Will: Our last gig either sold out or was dangerous to come to because it was so packed so we thought we’d see how we’d do in a bigger venue. Is that what made you guys decide to do this gig? Like you say, you haven’t played here in a while? Mark: The last 2 EP launches were at venues that sold out and we thought we might as well take a gamble on this and just do it. We managed to play Rescue Rooms as part of a showcase as part of Notts Factor. Will: We really enjoyed the sound and the room and everything and we thought this would be great to actually play with a full set. Russ: it’s just nice to play venues in Nottingham that are making it special so its special to us and the people coming and we’re not just saying yes to everything. If you play a venue where everyone has a chance to come see you, that’s great too. Will: Yeah, rather than play a venue and upset people when its sold out. Obviously you said that you played quite a lot outside of Notts recently, so how would you rate the Notts music scene in comparison? Will: We’ve definitely had more people at our Nottingham gigs than our Leicester, or Sheffield or Manchester. It has always been a good scene from my point of view. Russ: Other promoters in different cities will say its quite different compared to the outskirts of the Midlands. It’s a bit of a centre until you get to Birmingham or Sheffield. It’s one of the better scenes around this region. Mark: What I really like about the Notts scene is it’s really hard to pigeonhole. No one can really narrow it down to anything. Notts is just so diverse its hard to do. We have so many good hip-hop artists and indie bands and metal bands and soul singers. There’s something for everyone here and you don’t always see that everywhere. Notts hasn’t technically got a scene but it does have this melting pot with so much going on. You get a lot of support from places like Confetti and all the promoters we have here. They obviously want to be part of that. There’s so much support here. Do you think there’s a sense of camaraderie here? Obviously this gig has Revenge of Calculon and Soft Girls playing and they’re both quite different, musically, to you guys? Russ: We found it quite hard picking bands actually but we just went for really diverse bands because we didn’t want people to think ‘oh they’d be a really obvious fit for Gunships’. We wanted it to be a complete departure but still something our fans and us would enjoy. Mark: We actually had the chance to pick our supports which was pretty cool. Will: If you go to these psych nights with psych-60s-garage-rock, by the 4th band your pretty garage rocked out so I think its nice to give our fans some different bands to listen to. In the past, we have been put on a lot of gigs who are very similar to us. There’s five of us and we all like different things so its quite nice to have an opinion on who’s going to support us. Following on from that, how would you describe your sound? Will: I’d say it’s kind of bluesy because mine and Rob’s vocals are quite gruff and also the way it started was us listening to a lot of blues but you add other members and they bring different vibes. I’d say blues but with folk tinges. We do have some folky tracks. Mark: I always say ramshackle blues. A little bit blues but with other elements to it. It’s quite a unique sound. Will: It is shambolic at times… In a good way though. What vibes does each band member bring? Mark: I think someone like Leo who is our lead guitarist did a lot of piano playing and when I first met him he was doing some very strange things on an acoustic guitar, almost using it as a keyboard. Will: He brought in a different kind of sound. I’ve never seen a guitarist so dedicated to finding what sounds right in a song. Russ: He considers exactly what should be put in the song. I think everyone is particularly good at playing what needs to be played for that song. So you mesh well together? Will: Yeah! I bring in an element of simplicity so I’ve written the songs that are either one chords, two chords or, maybe when I’m feeling adventurous, three chords. I think from the start that would work because I’d bring that and then other people would add to it and one of our most popular songs is just on one chord and its brilliant. Mark: You build it up from the bones. Someone else puts in the flesh and in the end you’ve got a body. Will: That’s the blues element. Keep it simple. Mark: Me and Russ bring a pounding rhythm section. I bring the drums; he brings the bass. Russ: In this band particularly I’ve really got into the tone of the bass – picking the right notes for the song and the amount of distortion you use is really important. I try and keep it as simple as possible but as good as possible. Mark: A lot of what I always say is you have to let it breathe. As much as you need the bits where everything is going on, you need the bits where there isn’t much going out. You need to give the audience time to breathe too. We’re really good at knowing when to drop out, as a band, and feed off each other. See them tonight at Rescue Rooms , don’t miss out. This’ll be a good’n! INFL Ltd, Unit 5, Cobden Chambers, Pelham Street, Nottingham, NG1 2ED.